The Atlantic Swordfish! Here are some tips to catch them off the Virginia Coast. As most saltwater anglers are aware, a magnificent creature patrols the depths of the ocean waters off our Mid-Atlantic coast. This fish is most certainly a silhouette of power, grace, and remarkable distinction. Appropriately earning the title, “gladiator of the deep,” those who tangle with this beast can attest to its shear might and determination. While no stranger to our waters, a rekindling of interest inspired by a smattering of recent recreational catches has the dynamic Atlantic swordfish reemerging into the spotlight. At the very least, swordfish are beautiful, interesting entities with a dynamic history. The swordfish exhibits a striking appearance, sporting a stout, rounded body overshadowed by an extra long, flattened bill, thus its namesake. As voracious nocturnal feeders, their large black eyes and blackish-brown color make swordfish perfectly equipped for deep water and night time stalking. These incredible fish are a pelagic species found world wide from tropical to temperate waters. They are considered one of the largest and fastest predators in the ocean, growing to massive sizes of up to 15-feet and over 1,400 pounds, with the current all-tackle world record sitting at 1,182 pounds. Pacific swordfish grow much larger than swordfish in other bodies of water, whereas in the Atlantic Ocean, the females generally reach a maximum size of around 700 pounds. Males are the smaller of the two sexes, rarely exceeding 300-pounds. Sexual maturity is usually expected from three to six years of age, and swords can live for up to 25-years. Although much of their daytime is spent at depths ranging from 650 to 2,000 feet, it is not uncommon to find swordfish basking on the surface, which makes them easy targets for harpooners. Swordfish are known as very strong jumpers, often seen breaching high into the air which may be an attempt by the fish to dislodge external parasites, or perhaps to stun its prey. The bills of these fish are an amazing feature deserving of great awe. This unique appendage differs from the bills of other billfish in that they are truly sword-shaped. This sword is as long as one-third its body length, pointed, and very strong and sharp, thus creating a lethal weapon. When handling these willful animals, any wrong move can be very dangerous with deadly consequences. Stories are told of irritated swordfish actually puncturing the planking of small boats with their bills during fateful skirmishes. The highly migratory swordfish are found throughout the world’s marine ecosystem, including the Atlantic, Mediterranean, Indian, and Pacific Oceans. Migration patterns are such that Atlantic swordfish tend to seek colder northern waters during the summer months and warmer waters farther south during the wintertime for spawning. Swords are found year-round in subtropical and tropical regions. 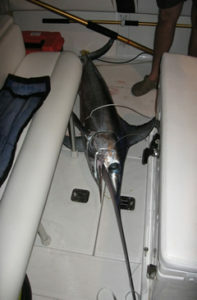 Unlike other billfish, swordfish possess a unique ability to tolerate a broad range of temperatures, allowing easy transit through many temperate water conditions, lending to a wider distribution. With this unique tolerance, swordfish are also able to travel deep within the water column where temperatures may hover around freezing. Swords have a special anatomical adaptation allowing for this existence in such cold water. This anatomical feature consists of a bundle of tissue with a specialized vascular system which insulates and warms the brain, thus preventing brain damage due to rapid cooling during extreme vertical movements. Swimming alone or in very loose aggregations, swordfish are mostly solitary hunters. These predators of the deep will feed at very deep depths, moving to the surface mostly at night in search of smaller fish such as menhaden, herring, mackerel, bluefish, hake, and butterfish. Sword in the north Atlantic, swords also prey on squid and other cephalopods. Swordfish are a favorite sport fish dating back to the very beginning of the development of the sport fishing industry. The powerful fight and incredible table fare offered by these massive billfish make the swordfish a prized target among recreational anglers all over the world. In the mid 1970’s, the recreational catch rate climbed to new heights when anglers discovered that night-time fishing with lights was an extremely effective method for sword fishing. When targeting swordfish in Atlantic waters, adhering to the recreational regulations is a must unless you are up to a hefty penalty. The daily limit for recreational anglers is one fish per person, with a maximum of three fish per boat. The minimum size is 47 inches, measured from the lower jaw to the fork length. A vessel permit for catching highly migratory species is required by the National Marine Fisheries Service when targeting these fish. Remember to report all swordfish catches to the NMFS within 24 hours of the catch, this reporting helps with data collection.